Few genres of music are as unpredictable and mysterious as jazz, and author Jonah Winter’s new picture book gives readers a good idea why. 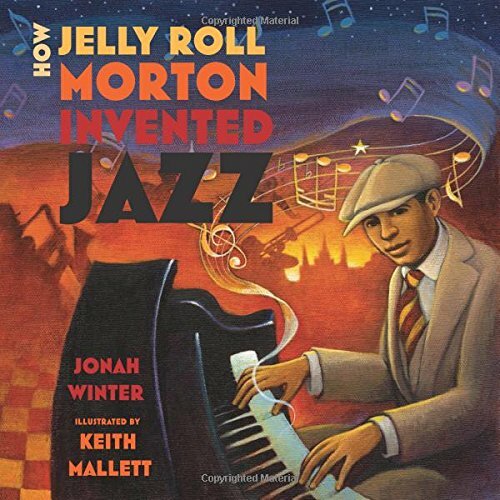 In How Jelly Roll Morton Invented Jazz the story of Jelly Roll Morton is as improvisational as the jazz itself. From the opening page, a nameless, faceless narrator offers readers several hypothetical scenarios that explain how Jelly Roll Morton came to be and how he helped concoct the “rich stew” that is jazz. For instance, readers learn how Jelly Roll’s voodoo queen godmother put a spell on him, how she often took him to saloons and sat him right down on the bar, how he went right to jail with her when she got into trouble, and how he wouldn’t stop crying until the inmates sang to him. All these scenarios and more supposedly inspired Jelly Roll to create jazz and make it what it came to be. Presenting the storyline in hypotheticals is quite creative and inspires readers to place themselves in Jelly Roll’s shoes and imagine how they might have turned out if their own lives had gone that way. This in itself could bloom into a great lesson in creative thinking, environmental studies, and personal development (adjusted for a younger audience, of course). And so, although the individual scenarios in the early pages are quite exciting and mysterious, the reader may find (reluctantly!) that the abrupt shift in presentation makes for a somewhat choppy read. Still, Mr. Winter’s enthusiasm for and devotion to this man and his story are quite obvious. This fact, coupled with artist Keith Mallett’s illustrations of dark, rhythmical silhouettes on hazy stages or in smoke-filled saloons, moving with eerie devotion to the unique cadence of that thing called jazz, make this book the perfect keepsake for history lovers everywhere.